Have you ever read a book and felt like the author was talking about you and to you? 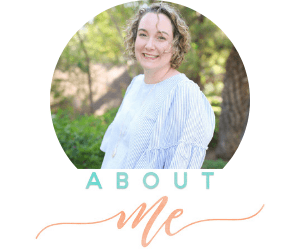 If you feel like you just can’t get ahead, or even breathe, Heidi St. John, in her book The Busy Homeschool Mom’s Guide to Daylight by Real Life Press, takes you by the hand and guides you step by step to freedom. Motherhood is hard. More times than not this year, I have felt like I was failing. I have wanted to give up more than once but we are pushing through to finish this year strong. We actually looked at other alternatives for schooling for the Fall because I didn’t think I could do it. This school year was tough. 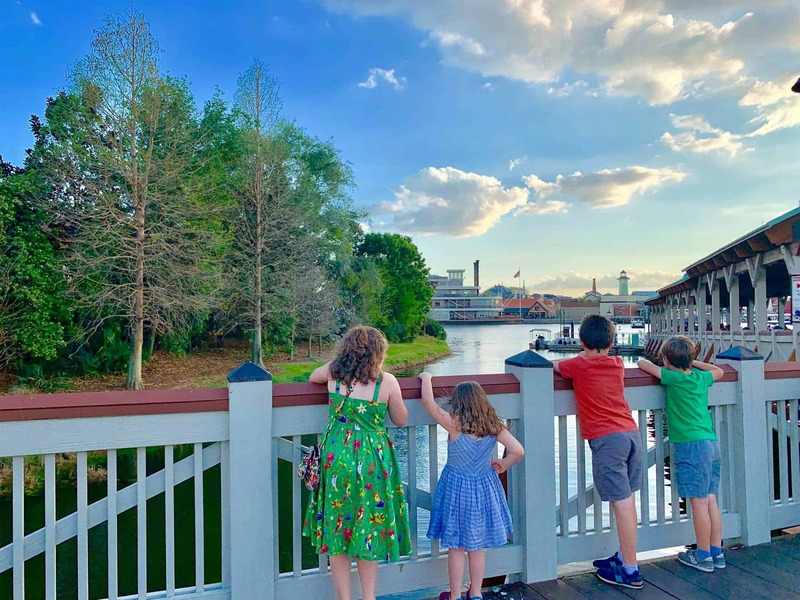 Every day I struggled to get through school, housekeeping, meals, all while working at home and tending to my littles. I knew that I needed things to change, but I didn’t know what. I knew I needed to declutter and get rid of things, but the task seemed too overwhelming. I would stop before I even started. 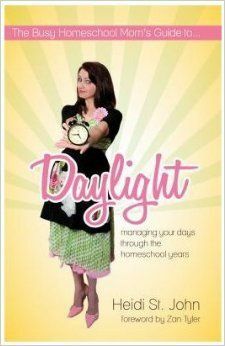 Heidi St. John makes it easy in The Busy Homeschool Mom’s Guide to Daylight. I knew that all the stuff was annoying and overwhelming, but she helped me see how less stressful life would be if I just got rid of it. If I don’t love it or use it, it needs to be gone. While I knew this, I wasn’t putting it into practice. You should have seen the van load of stuff we took to the donation center earlier this week. It was so freeing to be rid of that stuff. But we’re not done. We are committed to going room by room until our house has been decluttered from top to bottom. Everything in our house will have a place and I will be able to breathe. In the book Heidi talks about zones and how each child having a zone makes cleaning the house a breeze. While I can kind of use this with my littles, it will take lots of training. I am most excited about teaching my oldest how to do laundry! This never occurred to me before. She’s six. It won’t be perfect. I will need to be prepared for ruined clothing, I’m sure. But this will be a huge help for me and she will be learning much needed life skills. It’s a win-win! Have I told you that this book is exactly what this homeschool mama needed? If I didn’t know better, I would have guessed that Heidi St. John was peeking into my windows and watching our lives play out. The discouragement, the need to declutter, paper organization, homeschool supply organization, meal planning, homeschooling multiple levels. She even knew that I needed to look at the schedule of others to see how I can tweak our day to make it run more smoothly. My absolute favorite part about The Busy Homeschool Mom’s Guide to Daylight is that it points the reader to Christ, and His heart for our homeschooling. She calls out our distractions and stresses the importance of girlfriends who will hold us accountable to our task at hand. Most of our frustration and lack of time stems from our lack of self-control. Ouch. 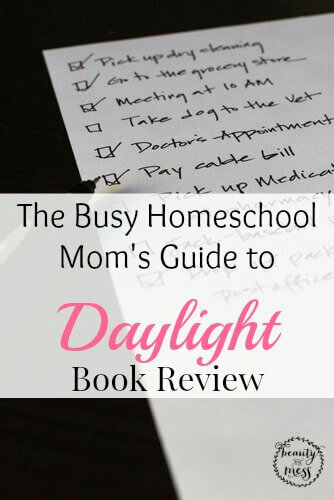 Whether you are just starting out on your homeschooling journey or are a veteran, I highly recommend The Busy Homeschool Mom’s Guide to Daylight by Heidi St. John. Reading this book is like having coffee with a mentor. I may love her just a little more since she’s not a morning person either. Yes Heidi calls out our messes but she doesn’t leave us in our frazzled overwhelmed state of being. She gives us a Plan of Action that is easy to implement and may very well save your sanity.